Proven small batch processes, expertise, efficiency, and true partnership. Our approach is different—and that’s why it works. On any other contract manufacturer’s website, you’ll find “from idea to installation” or some variation thereof. Not ours. 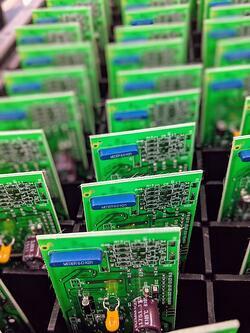 We’re masters of one thing—building and testing small batches of electronic assemblies—and we do it better than anyone. We take your completed designs (BOMs, Gerber files, etc.) and build and test your small batches on demand. We’ll create as many different designs as needed, whether you know your usage patterns or not. How many times have you been told by your electronic contract manufacturer that your recurring small batch work is critically important, only to discover later—when larger-volume jobs don’t come their way—that they’re unable or unwilling to support your needs? Whether it’s a prototype, a new product, a second-tier product line, a mature low-volume product, or a critical legacy system, if it’s needed in a small batch, RBB will move heaven and earth to get it to you, on time and under budget. We understand that small batch clients rarely enjoy large-scale savings on materials, but RBB’s exclusive focus on small batch provides many other benefits that can help you save substantially. Purchase no more than what you really need: Minimum order quantities will never apply. Minimize or eliminate costly safety stock: We build more than 150 unique SKUs for many of our clients, and each of them carries only nominal safety stock. There’s always room in our scheduling system to quickly produce a small batch. Capture more market opportunities by upgrading designs on the fly: Without a stockpile of pre-made assemblies, you can better react to the market. We can also make legacy boards just as easily as new ones. Enjoy competitive unit cost: Our unique approach to lean manufacturing will continue to drive your costs down. Save on overhead: Avoid the small batch hassles forced upon you by your current contract manufacturer—we prioritize small batches and they don’t. If you manage a large portfolio of devices that require recurring small batches, RBB is the trusted partner you’ve always wanted.